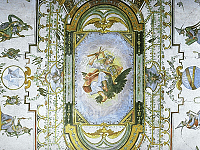 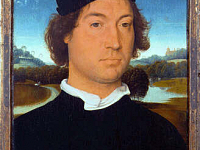 His patrons included the Hospital of Saint John in Bruges, wealthy merchants and burghers, as well as agents form the Medici family. 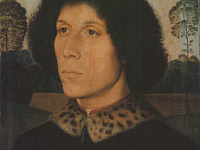 One representative of the Medicis, Tommaso Portinari commissioned an important altarpiece from Memling, and several portraits, one of which is in the Uffizi Gallery. 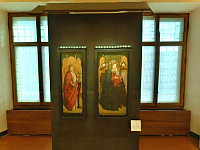 The altarpiece was Scenes from the Passion of Christ, a sweeping, almost bird’s eye, panoramic of Jerusalem, with Christ centered and several active scenes around the city. 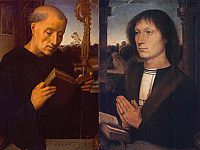 His other works at the Uffizi Gallery include his decorative Madonna and Child with two Angels, a Portrait of Saint Benedict from the Hospital of Santa Maria Nuova, his gracious, Portrait of Mater Dolorosa and two additional portraits. 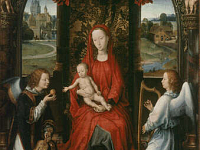 He had a large body of work, including nearly 20 altarpieces (with multiple panels), 15 depictions of the Virgin and Child, 20 Representations of Saints and other religious subjects, with over 30 portraits.